Measurements: Internal diameter of spinner hub: 3.125" External diameter of spinner hub: 3.5". Overall size: 6.25". Blade length: 2". Height of cap: 1.25" from hub. 3-Bar Spinners. These spinners are exact replicas of the original spinner but we have changed how they are installed. The spinner mounts on-top of a tower that is held onto your wheel with set screws. For instructions on how these mount, please click here. 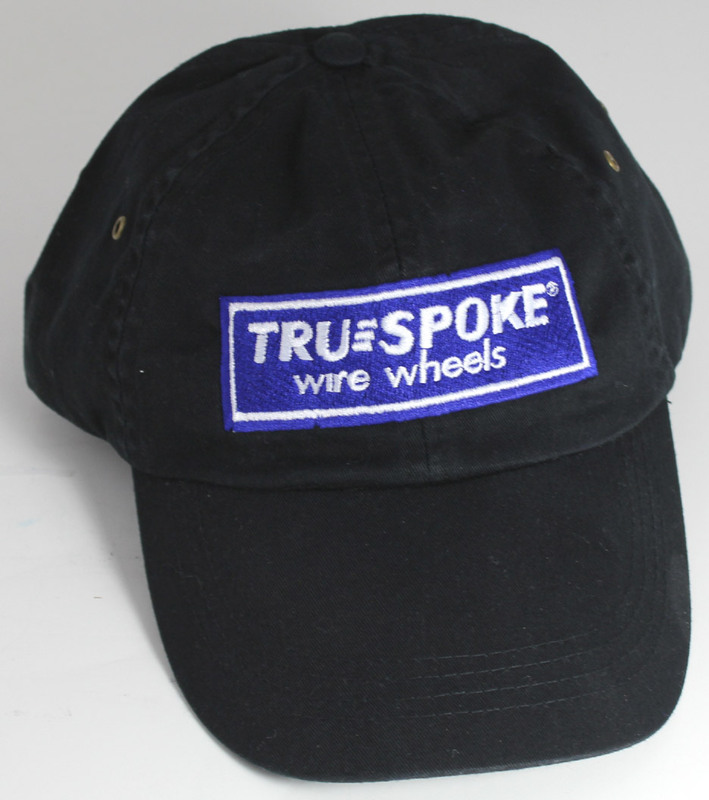 It is possible that these caps may not fit all vintage Truespokes®. Please measure the opening and let us know the size before you order. Your hub cap opening must be between 3 and 3.25 inches or these caps will not fit. Measurements: Internal diameter of cap: 3.100". External diameter of cap: 3.5". Height of cap: .650"
Replacement round (do-nut) style caps. These caps are made from thick zinc. They are very rich looking, not the tin-cap like style of the originals. 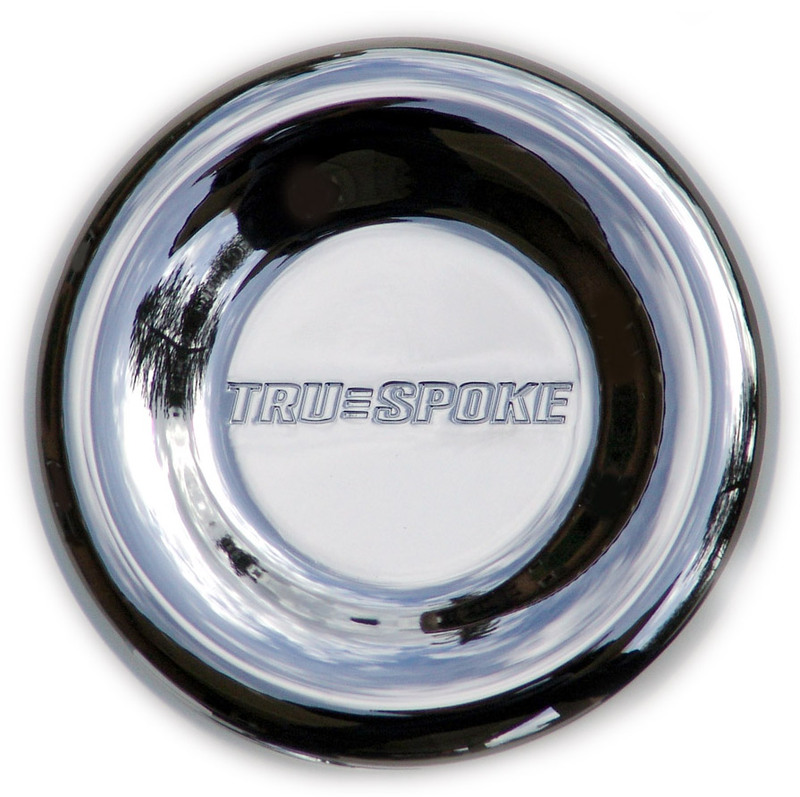 A set of four comes with a black or hologram Truespoke® emblem and mounting equipment. Please measure the opening and let us know the size before you order. Your hub cap opening must be between 3 and 3.25 inches or these caps will not fit. Please click here for mounting instructions. 1.25" threaded base. The base measures 3.08" and attaches with 3 Allen bolts which are included along with an Allen wrench. Once the base is secured, the spinner threads on securely. The base is chrome plated. 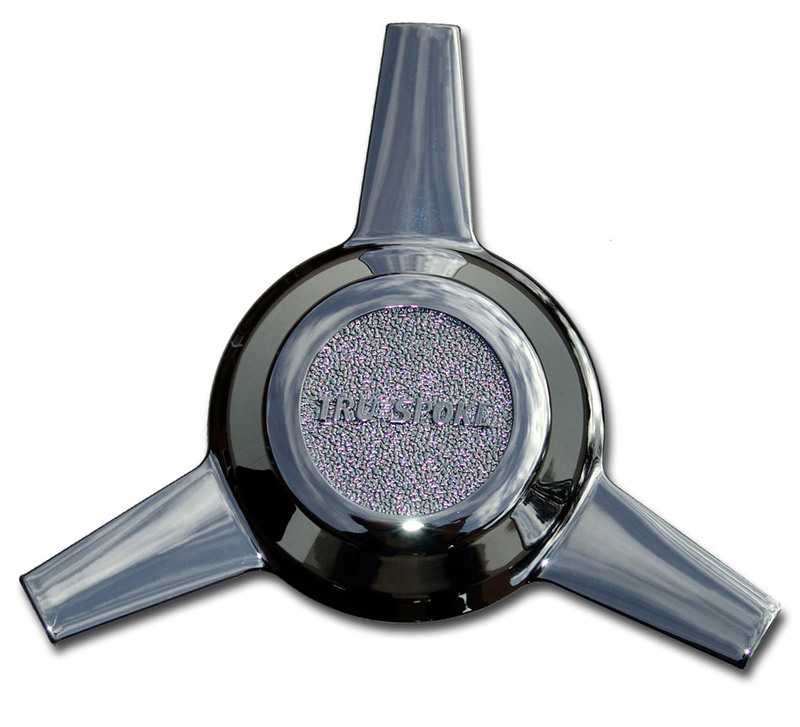 Included is your choice of black or hologramTruespoke® emblem. $50.00 each including the base and Allen bolts. 1.25" tall threaded base. The base measures 3.05" and attaches with 3 Allen bolts which are included along with an Allen wrench. Once the base is secured, the spinner threads on securely with an Allen bolt that is located under the wing of the spinner. 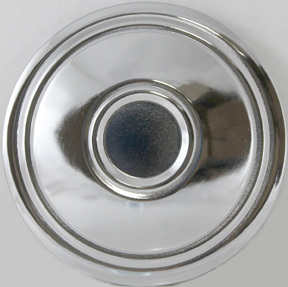 The spinner cap is chrome plated. 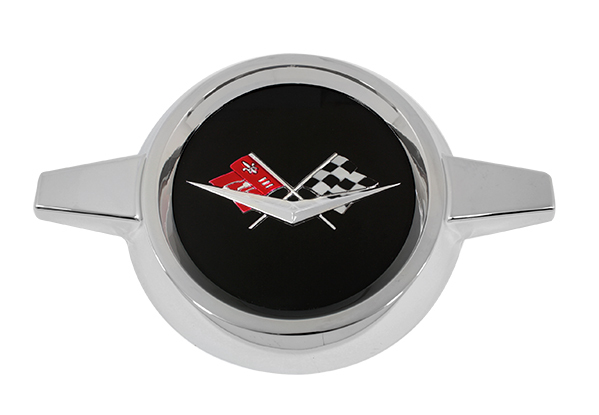 Included is your choice of black or hologram Truespoke® emblems. Finally back in production after decades of being unavailable. Made from hologram-look type material. Donut cap shown is NOT included. Price: $50.00 for the set of four with free shipping in the continental U.S.
1.25" tall threaded base. The base measures 3.05" and attaches with 3 Allen bolts which are included along with an Allen wrench. Once the base is secured, the spinner threads on securely with an Allen bolt that is located under the wing of the spinner. 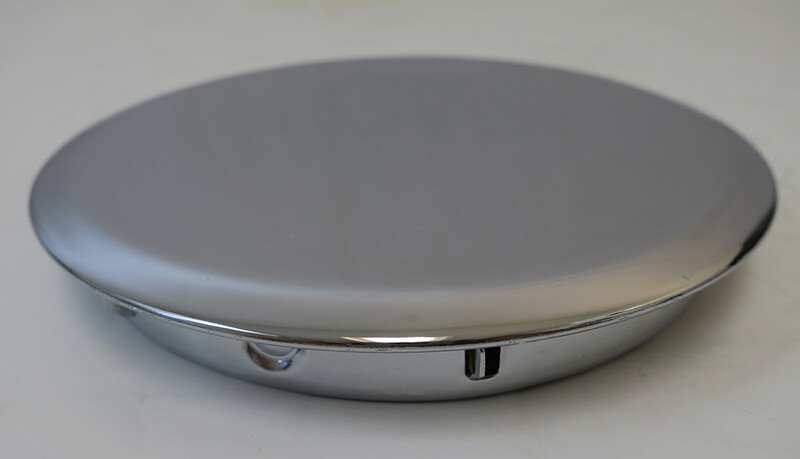 The spinner cap is chrome plated. 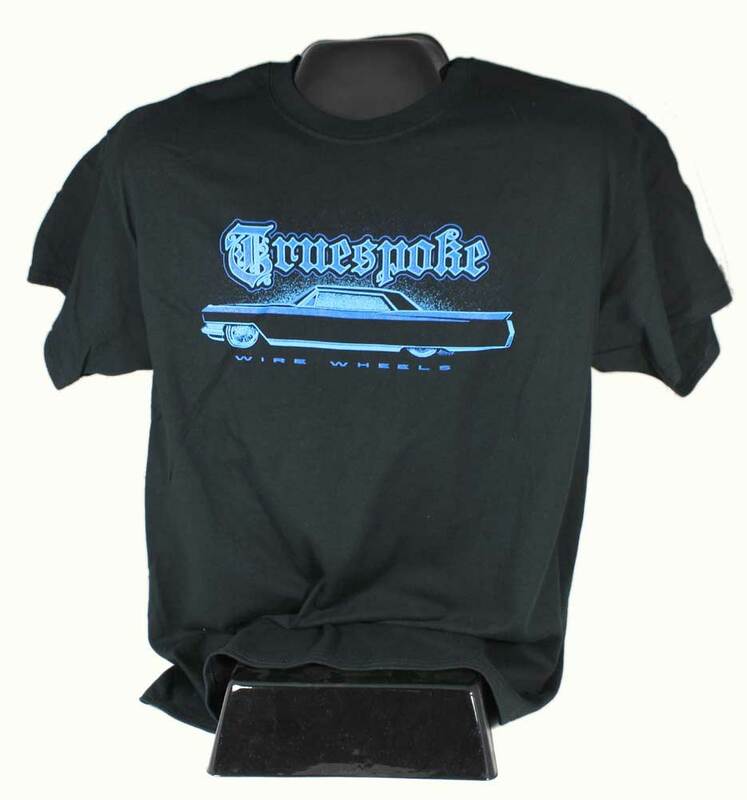 Included is a Cadillac emblem that is a GM Authorized Restoration part. Price: $60.00 each with emblem. At last! 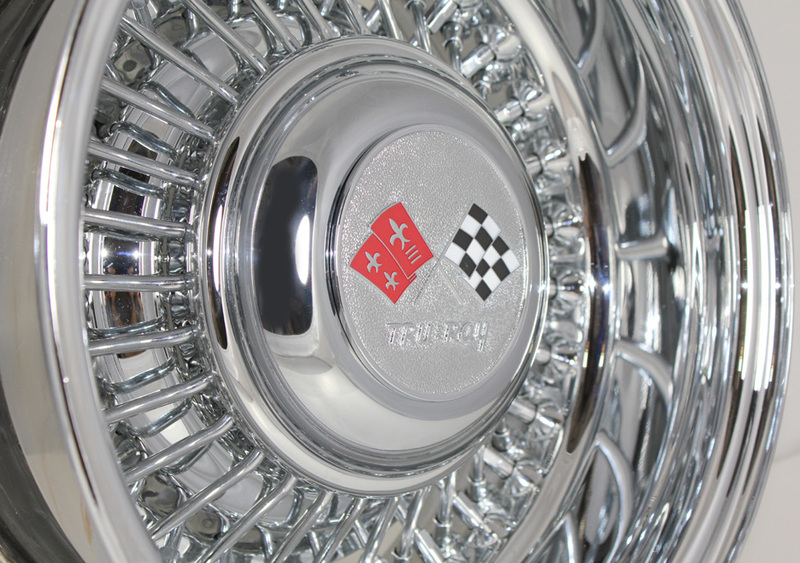 The original style Trueclassic® hubcaps with medallions are available. Fits vintage Trueclassic® and Trueray wire wheels. Hubcap opening hole must be 6.25 inches. The caps are retained by the bumps or "grains of rice" on the side exactly as the originals. 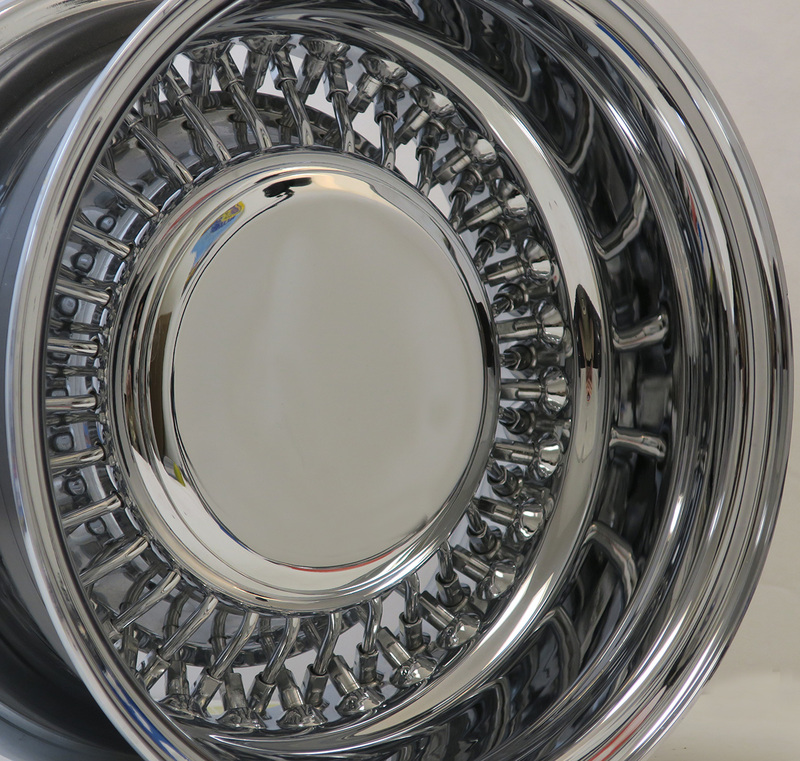 High quality chrome plating and construction. 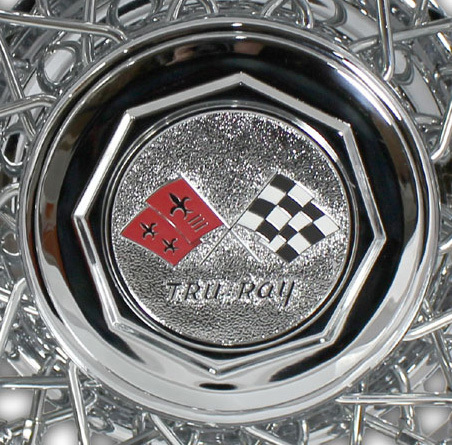 Includes the Trueclassic® medallion as shown. Price shown is for one cap only. Price: $125.00 per cap and medallion. 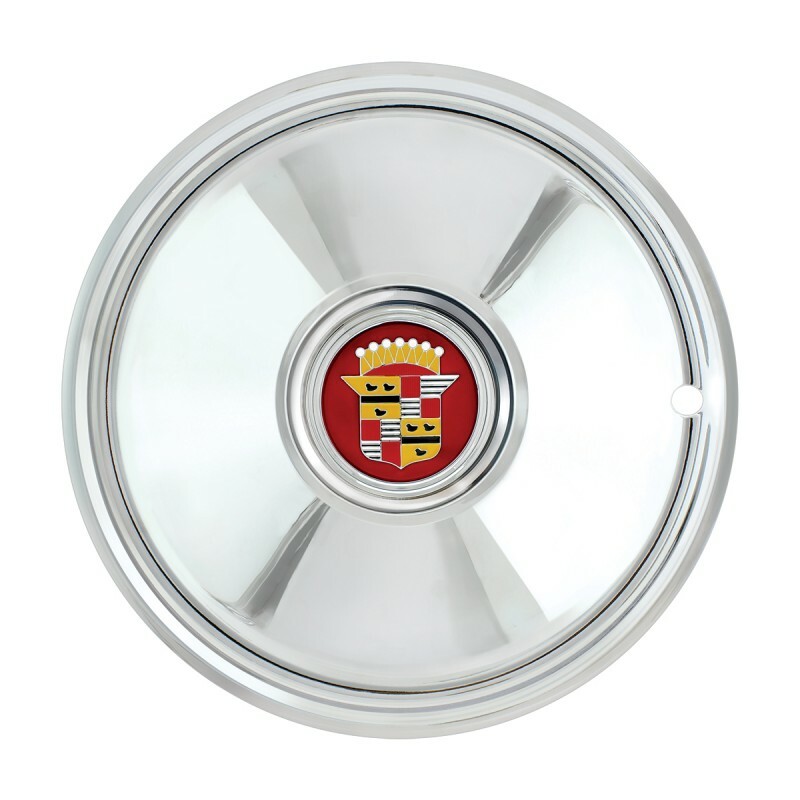 The original style Trueclassic hubcaps without medallions are available. 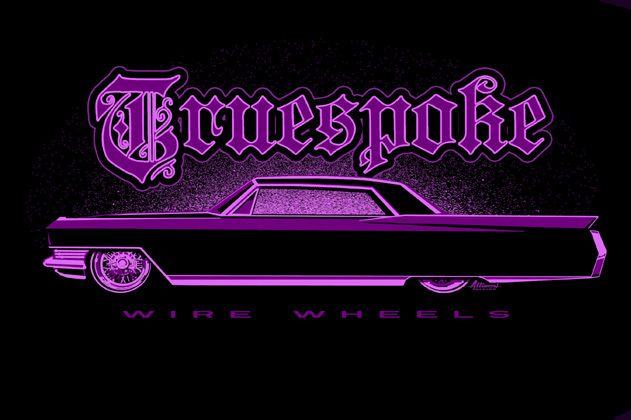 Fits vintage Trueclassic® and Trueray® wire wheels. Highest quality metal emblem - not plastic or a sticker. Amazing detail. A perfect replica. Limited production. 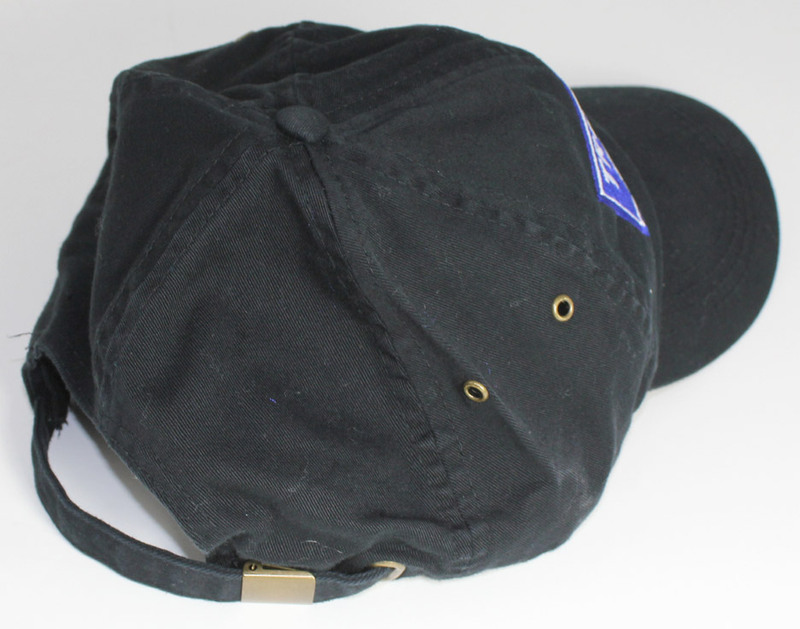 Includes metal clips to attach the medallion to your cap. Caps are not included but are available at extra cost. Set of four spinners and hubcaps. The spinner is bolted on to the cap. Sold as a set of four. Four spinners, four flat hubcaps fully assembled. 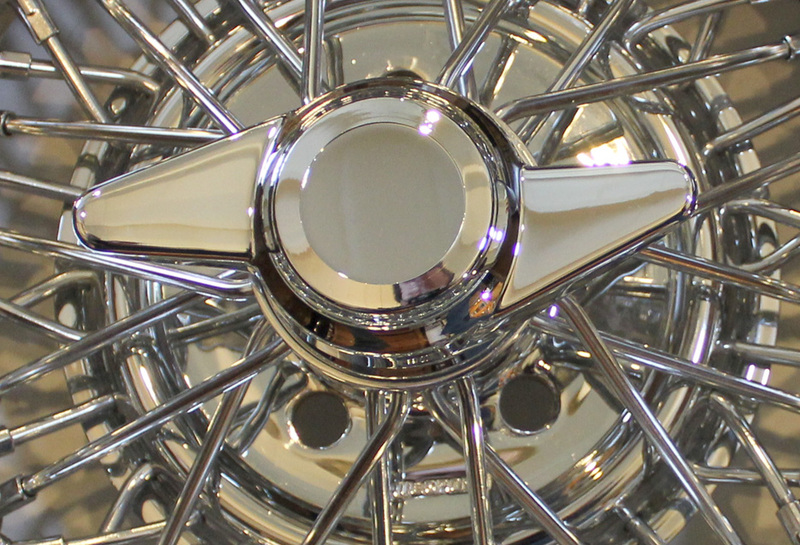 NOTE: The flat, chrome hubcap that is used with this spinner will fit in a hubcap opening on your wheel that measures 6.165-6.2 inches. 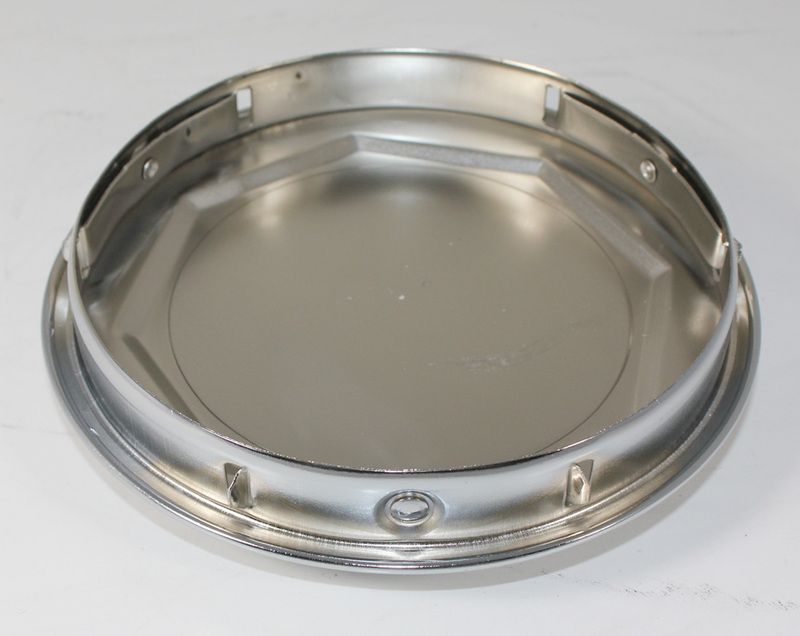 If your hubcap hole is larger or smaller than this, our cap will not fit. 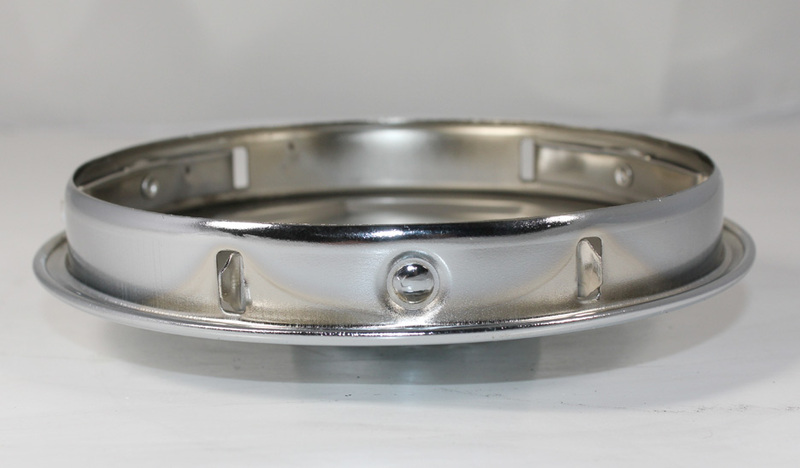 Measure your hubcap hole first before ordering. Call or email us with any questions. Spinners are not available separately. 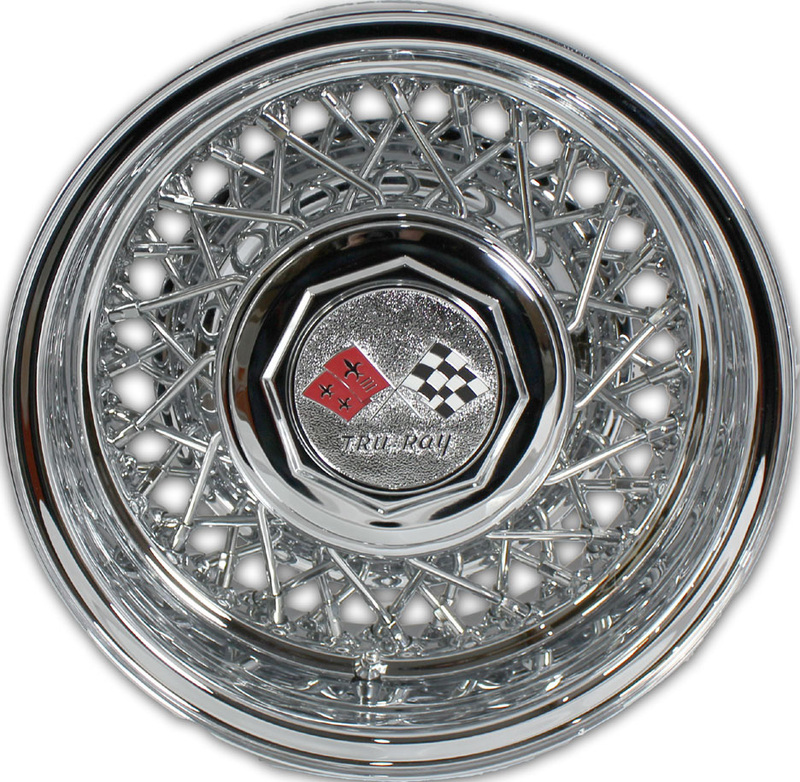 Price: $450.00 for the set of four spinners, four hub caps and assembly. Long out of production, we are pleased to re-introduce this special cap. The medallion is of the highest quality and the artwork is crisp and clean. 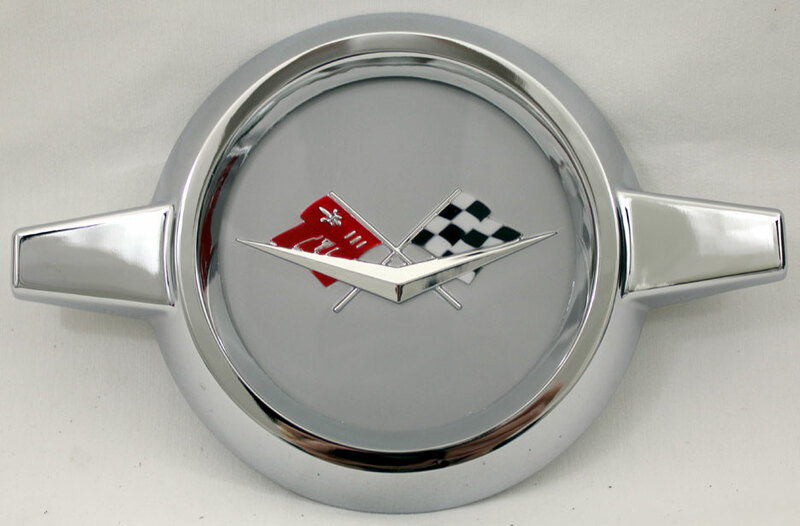 The medallion is made from chrome plated metal and is not the printed sticker or decal type. 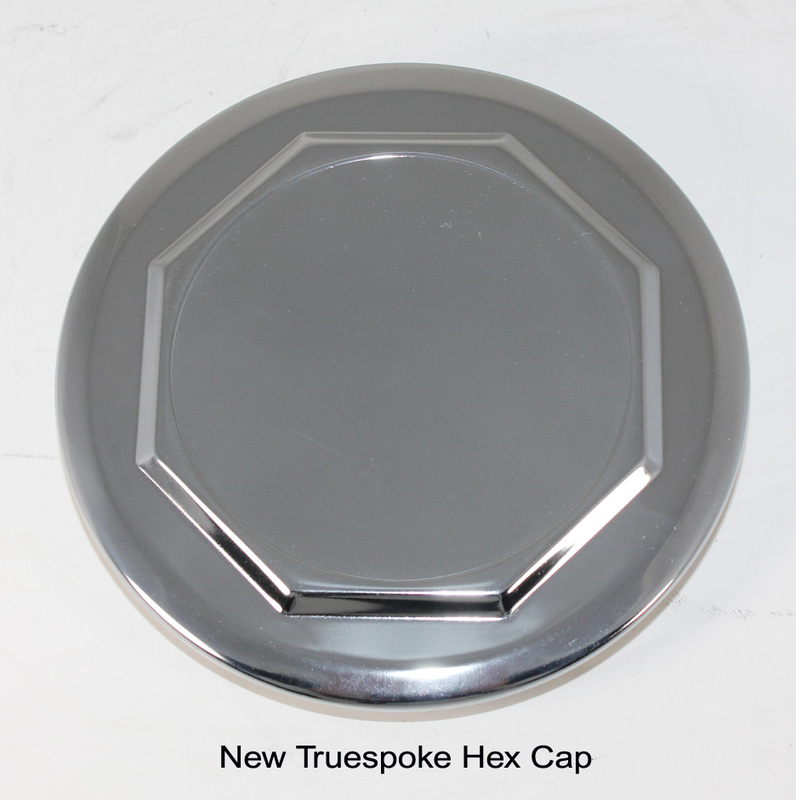 At last, the Trueray® medallion with the hex style cap is available, all-in-one. 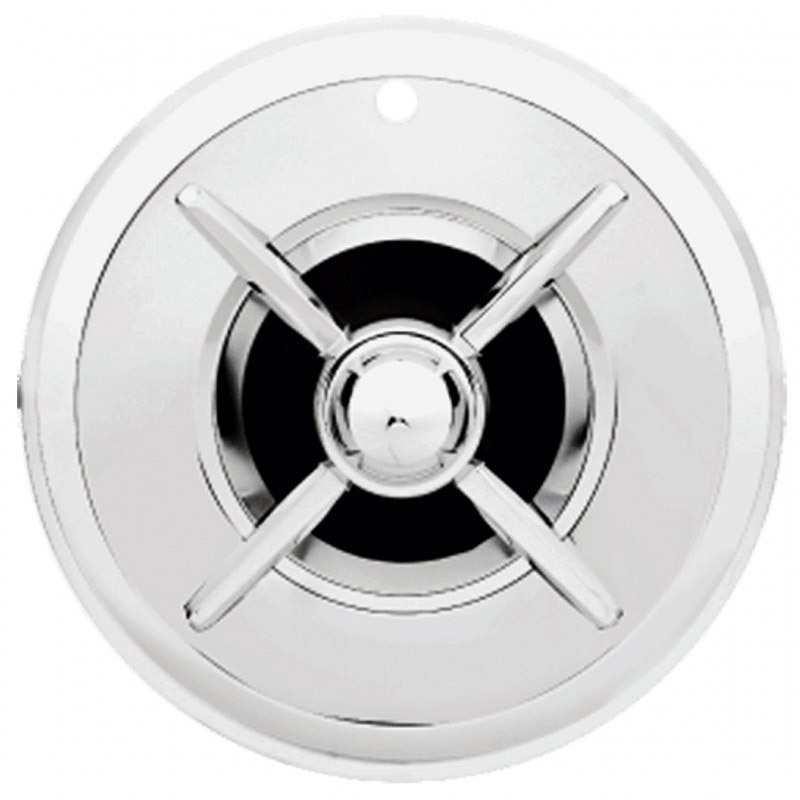 Factory authorized medallion is of correct aluminum material with chrome plated finish. Smooth backside with proper studs and comes with clips to hold the medallion on. 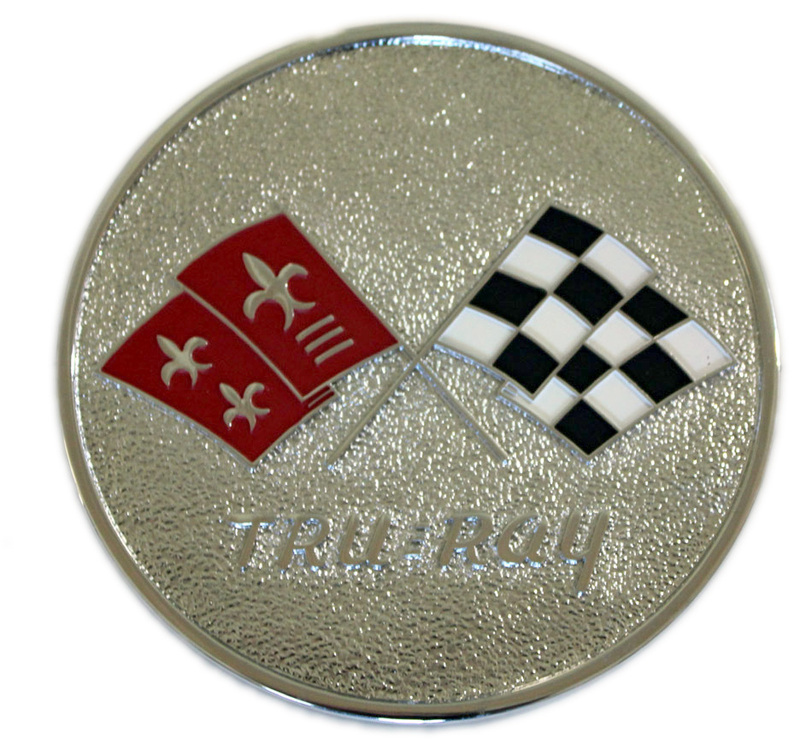 Outside diameter: 6.75" - inside diameter: 6.25"
At last, Trueray® owners can finally find an authentic and factory authorized Trueray® Crossed flag emblem. Comes with two clips to attach the medallion to your cap. This is the medallion only. The cap is available at extra cost. 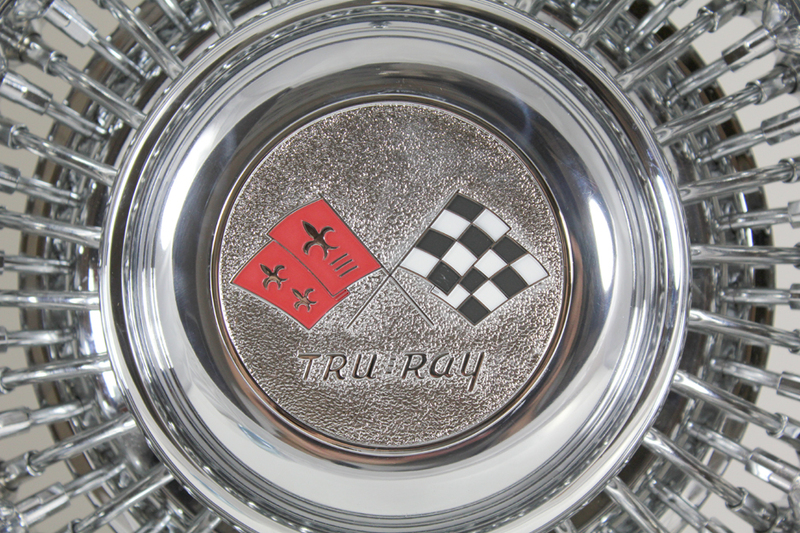 Avoid buying unlicensed Trueray® fake, poor-quality medallions which sadly are being sold on the black-market. 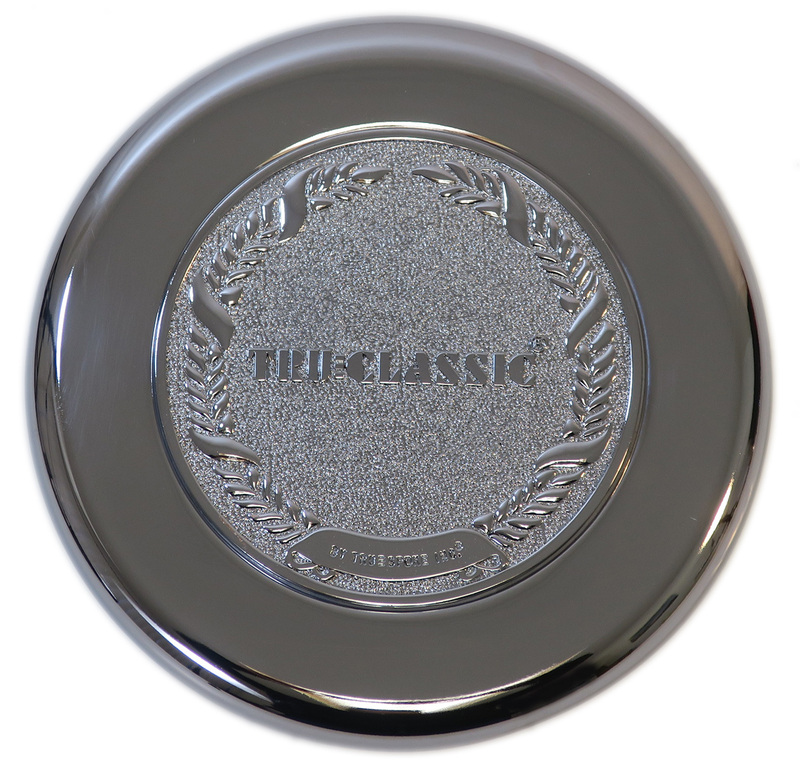 At last, the Trueclassic® medallion with the dome or hex style cap is available, all-in-one. Fits inside a 6.165 inch to 6.20 inch hubcap hole. 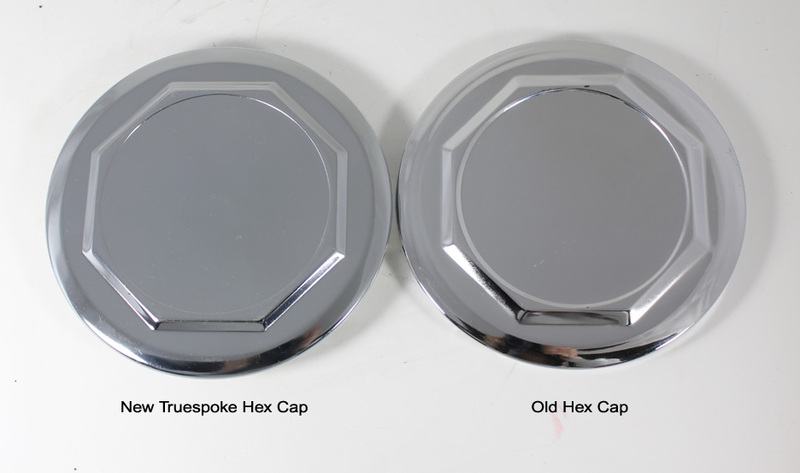 Select either the Dome Cap Shown or Hex Style Cap. This is a newly made cap with quality materials and finish. The cap is adjustable. It is not the original, tinny metal style of poor quality and plating. 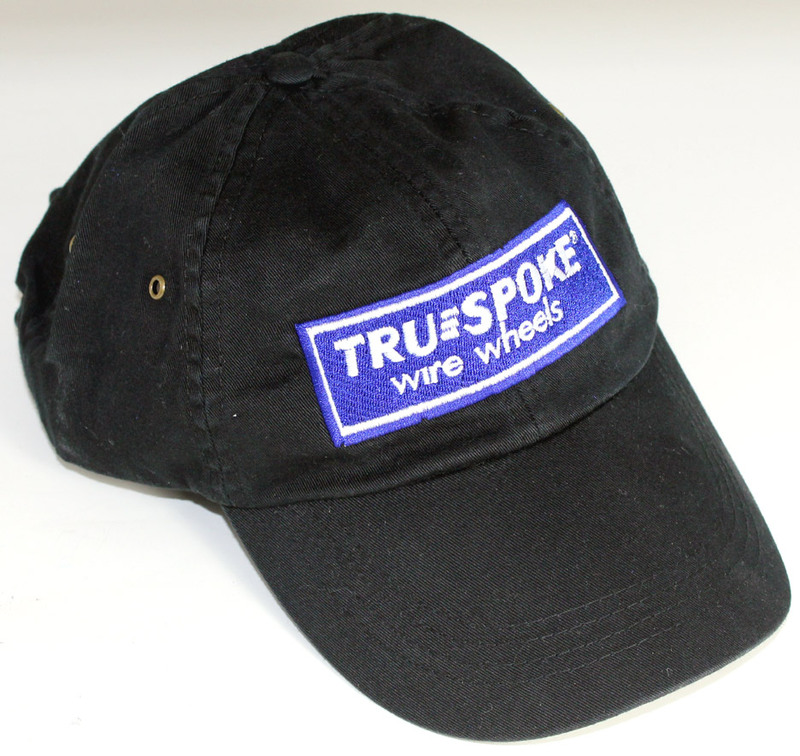 This cap is only available from Truespoke®. Medallions will finally fit properly in the center section, not overlapping like the inferior copy. The mounting hardware will keep your cap in place and is adjustable. The measurements of this cap are: Outside diameter of cap: 6.7". Internal diameter: 6.150". Your hub cap opening hole in your wheel should measure approximately 6.200". Please measure your hub cap opening hole in your wheel prior to ordering. Please click on the above thumb-nail images to view larger photos comparing the new and old caps. 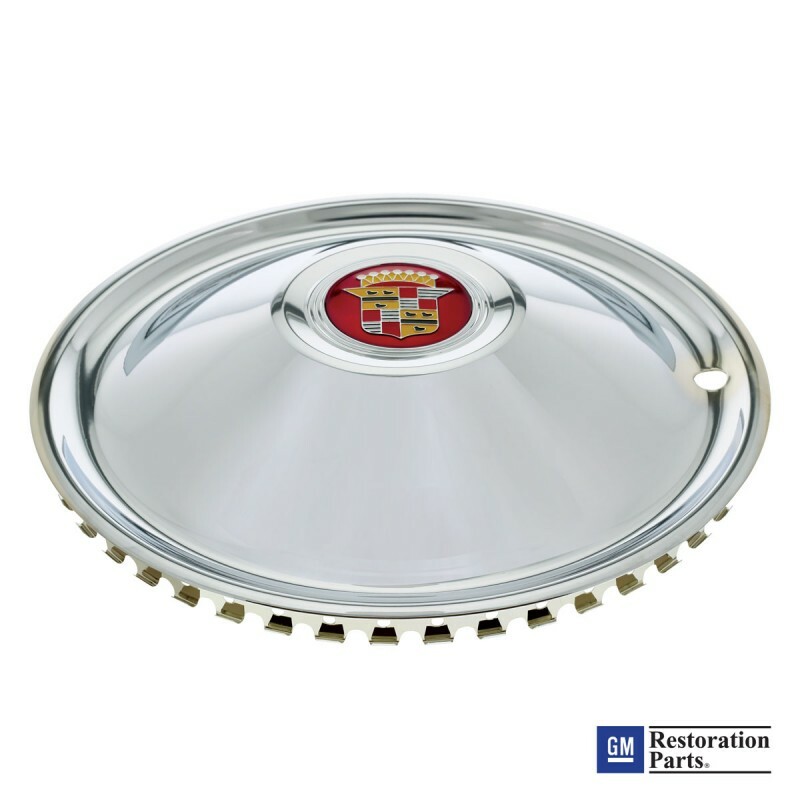 All-metal hubcap. Excellent chrome plating. 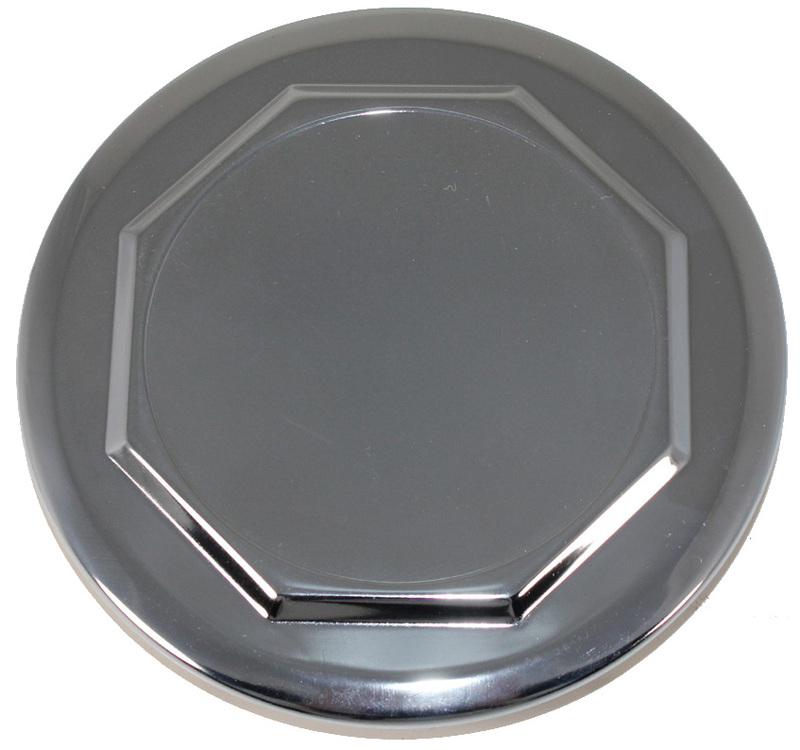 Flat, smooth top is ideal for installing medallions, emblems or 1959-1960 Chevrolet spinner caps. 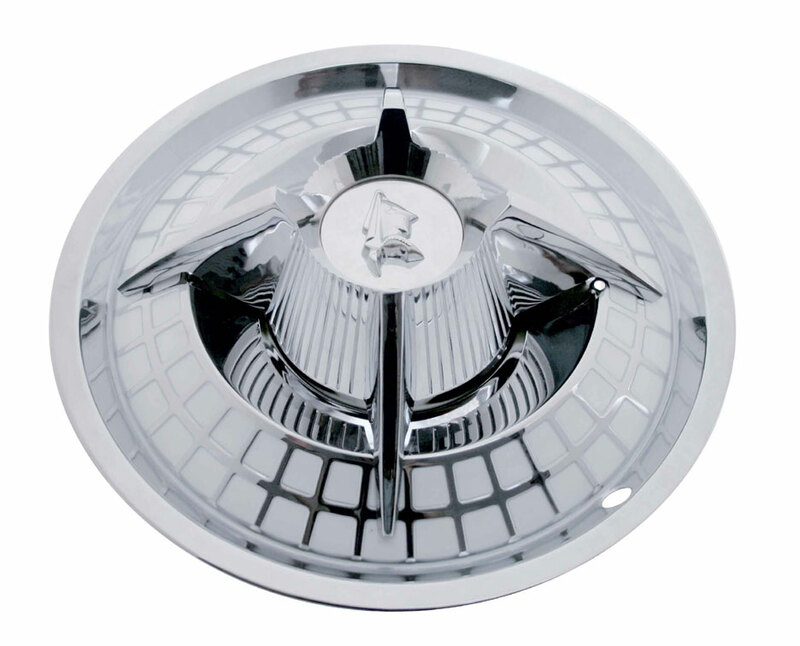 Fits hubcap hole size: 6.165". 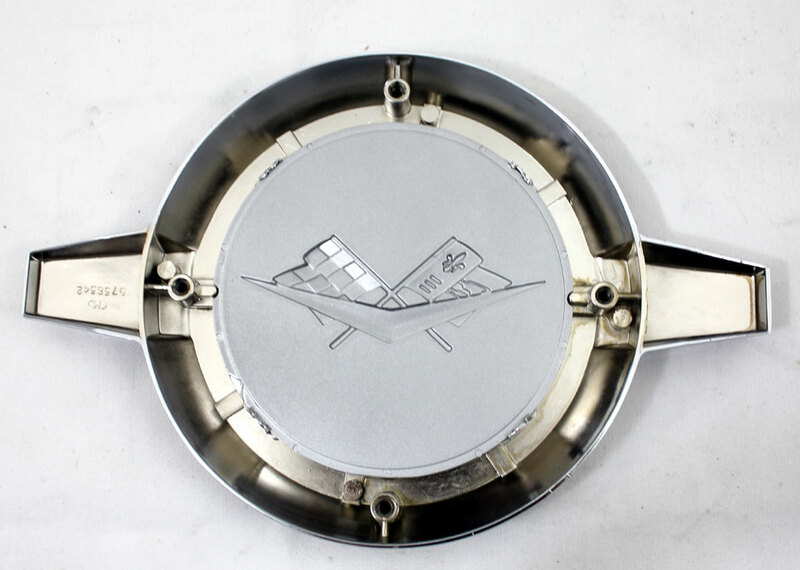 Please measure your hubcap hole before ordering. Will not fit securely in hubcap holes larger than 6.200". You may need to use electrical tape, silicone or Loctite to hold the cap tightly. Does not include wheel. Wheel shown is a Trueray. 16 inch diameter wheels only. Will NOT fit a 15 inch diameter wheel. Will fit wheels with a hubcap opening of 6.25". 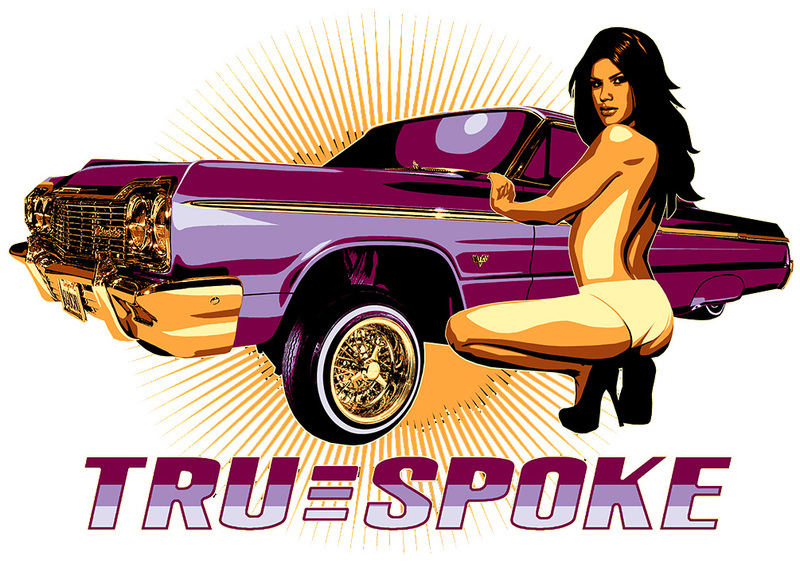 Made with Truespokes in mind. Thread patterns: 7/16", 1/2" and 12mm X 1.50. Shank lengths: Short - .55", Standard - .75" and extended - 1". Please do not order unless you are certain which size and style you require. Call or email us first for assistance. We are happy to help. Thank you. 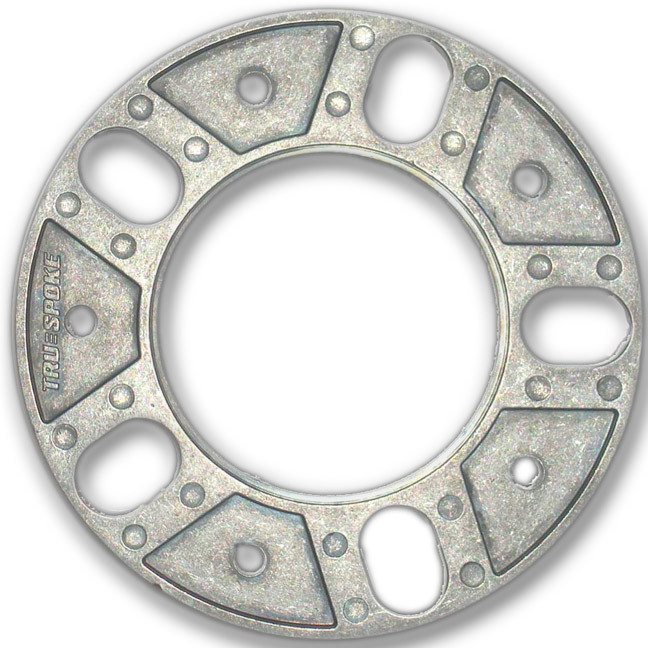 Use oblong washer for 5 on 4.5" and 5 on 5" bolt patterns. 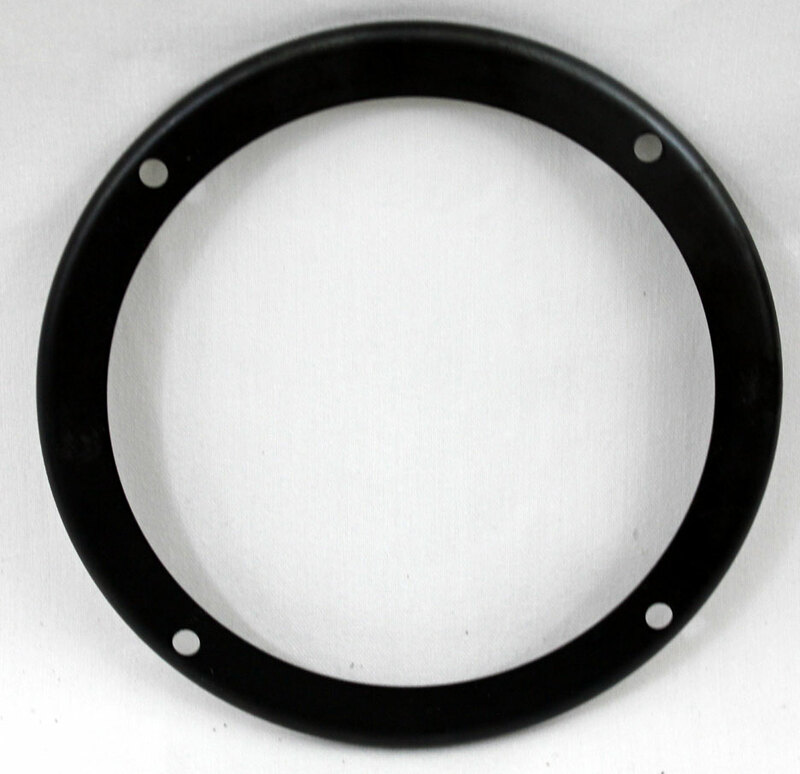 Round style washer is used for 5 on 4.75" bolt pattern. Looking for an aggressive and very cool look? 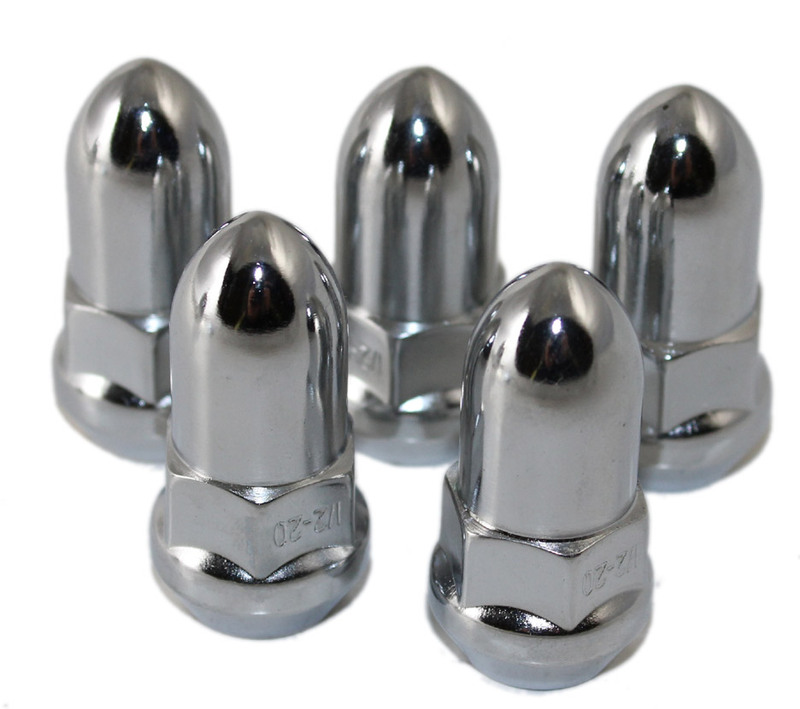 These bullet lug nuts look great on all wheels especially chrome rims or colored with trim rings. Kit include 20 bullet lug nuts and 20 correct style washers. Please specify your thread pattern. Thread patterns: 7/16", 1/2" and 12 mm X 1.50"
If you aren't sure which style you need, simply call or email us. or colored with trim rings. Truespoke® Front Wheel Drive Trim Ring 15"
At last! 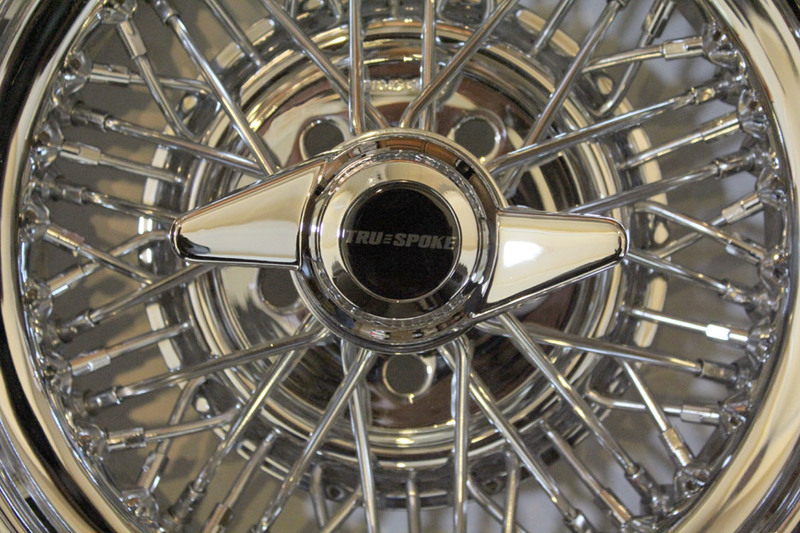 After years of being out of production, we are pleased to offer trim rings for the hard to find, front wheel drive and lip-lace Truespoke® wheels. The trim rings are for 15 inch wire wheels only that have the grooved area as shown in the photos where the trim ring snaps in. These are made from plastic and fit quite well. The chrome plating is excellent. 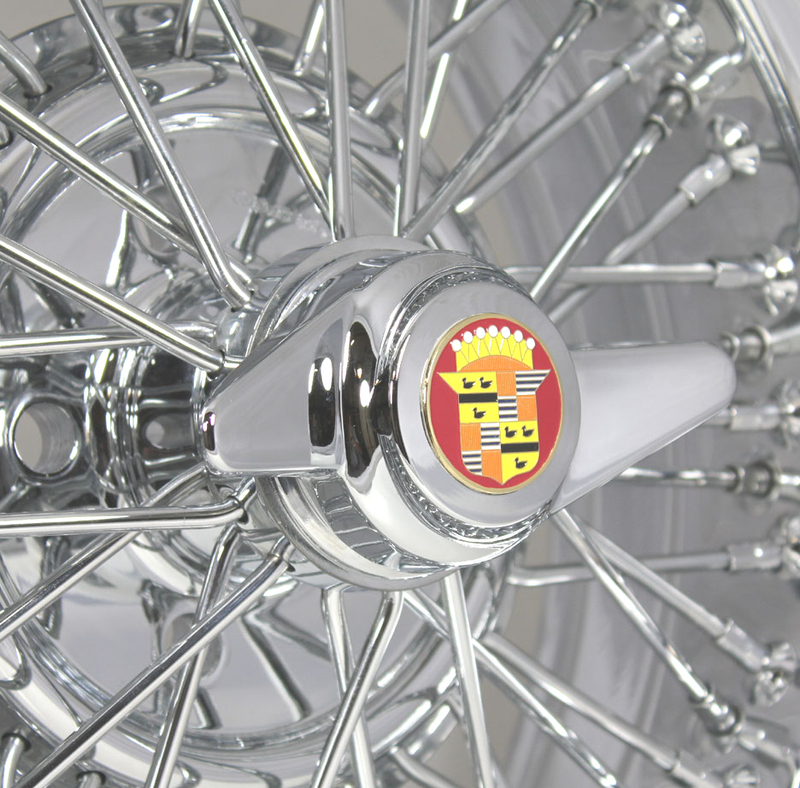 The trim rings will not fit standard or reverse Truespoke® wire wheels. These are very limited production. Sold separately. Price shown is for one trim ring only. The wheel shown is not included. Price: $60.00 per trim ring with free shipping. 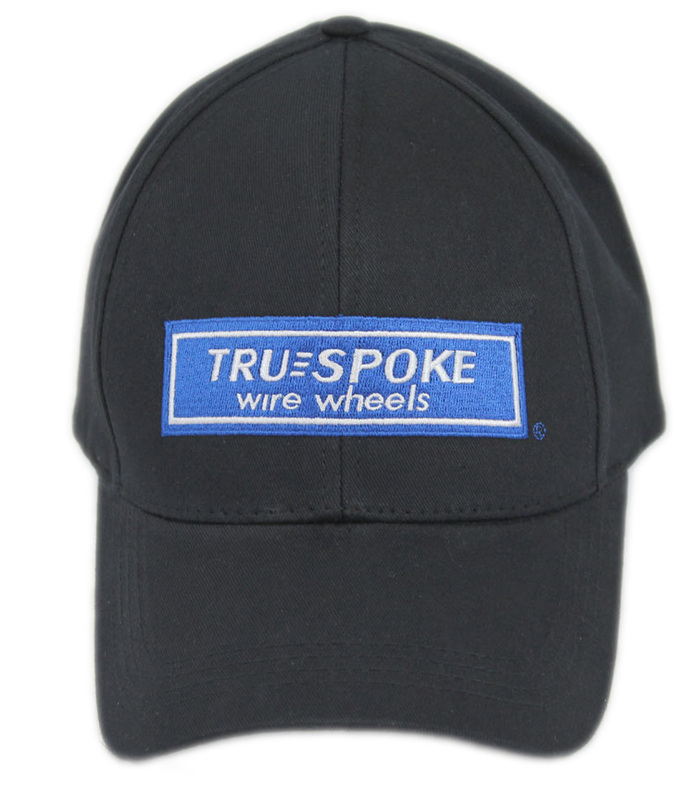 Show your Truespoke® spirit with our new baseball style cap. 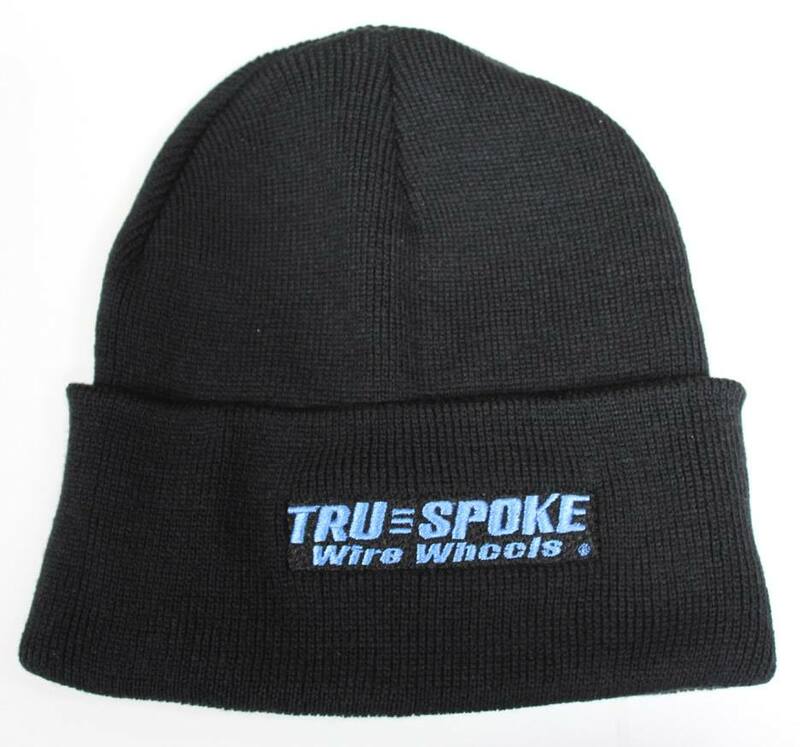 High quality embroidery with the classic Truespoke® logo. $16.95 plus shipping & handling. Black only with blue embroidery. Price: $9.95 plus shipping each. 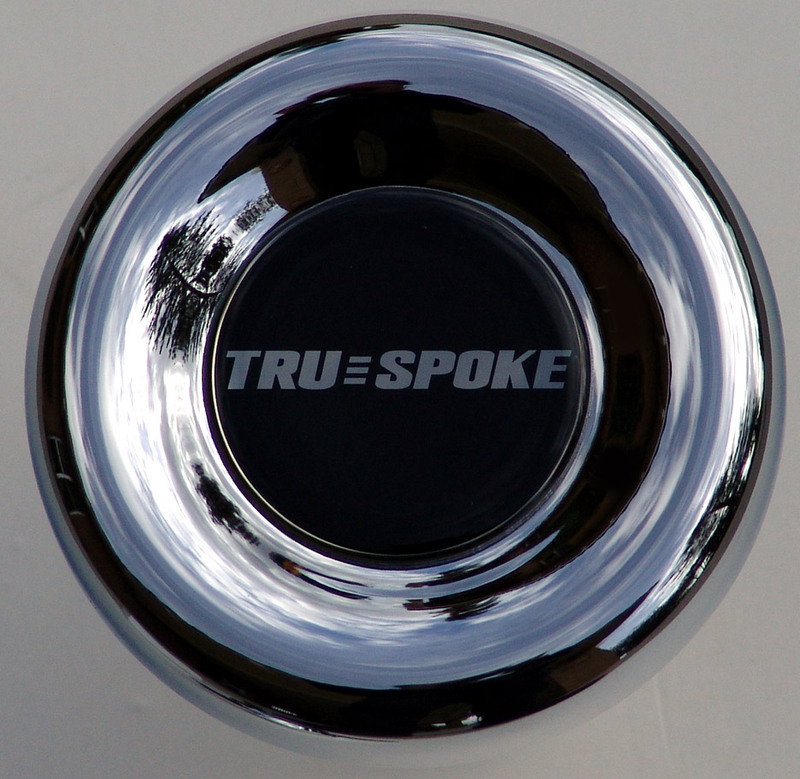 Used by Truespoke® on all our wheels both new and in our restoration process. The ultimate external security pattern. Lock and key engage precisely. Made from hardened steel and triple chrome plated for beauty. The most advanced lock money can buy. Virtually impossible to remove without the matching key. Comes with a key code label to order replacement keys. Closely resembles an ordinary wheel lug. Protect your wheels from scratching during installation. Protective plastic sleeve guards expensive wheels from damage. Thin walled sockets fit between the spokes like a charm. Comes in a sturdy case. Color coded for quick selection. Fits passenger and light truck wheels. Impact strong. 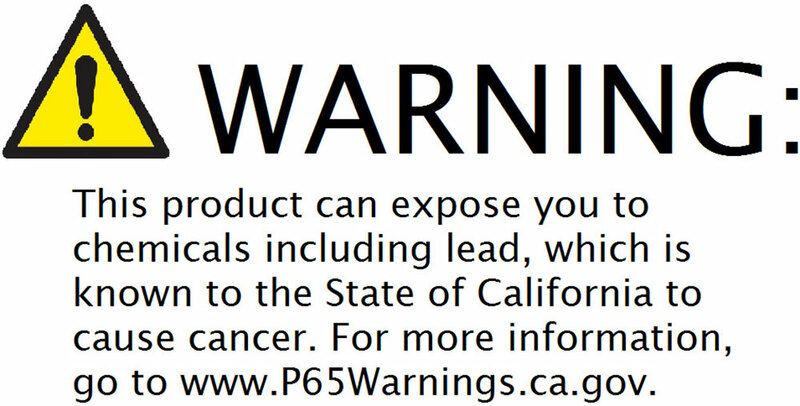 Made from chrome Vanadium steel. Set of four in protective case. Sleeves are removable for extra thin wall requirements. Extended shoulder for extra protection. Sizes: 17mm, 3/4", 13/16" and 7/8" sockets. Price: $49.95 for the set of four. Provides leverage to remove even the tightest lug nuts with ease. 200% more torque than a standard lug wrench. Includes a polybag case for convenient storage. Comes with a 3" extension. Pre-drilled for bolt holes. 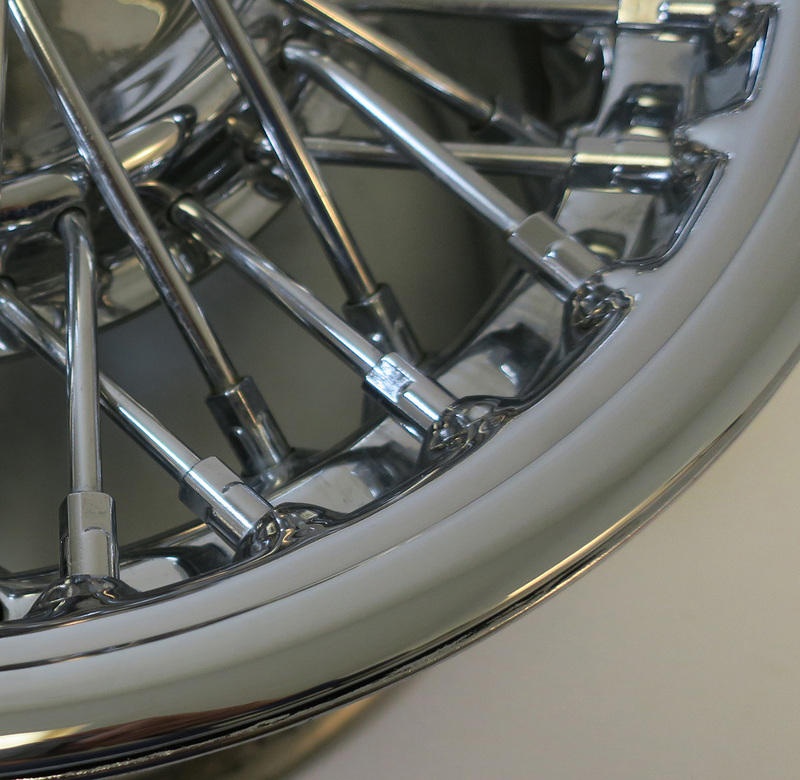 Multi-lug patterns: 5 on 4.5"/4.75"/5"
To order, simply call us at 760-731-8301 M-F 9-5 PST. and how it helped shine up a very rude wire wheel! Overview: Why do whitewalls turn brown when we haven’t even driven the car around? It’s not magic, it’s not bad luck, and there’s actually a scientific reason. During the manufacturing process of your tire, manufacturers use a mold release agent to prevent the tire from sticking to the mold. Sadly, this same material can burn like butter in a frying pan if the temperature is too high, leaving a brown, sticky substance embedded deeply into the whitewall tire pores. This trapped chemical subsequently escapes when it experiences a rise in temperature and when exposed to sunlight. Upon cooling, more of this trapped chemical will ooze out causing your whitewalls to become noticeably brown. To solve that problem, the Whitewall Tire Brown Buster is specifically designed to remove the brown stains and in turn replace them with a pure, food-grade filler material to make your whitewalls look new again. Using this product is a four-step process. This is not a “wipe-on, wipe-off” type product. Removing brown stains has been nearly impossible in days gone by but this product will do the job. Of course it requires a modest amount of effort but your work will be rewarded, saving you hundreds of dollars or more replacing your tires and having to dismount, mount, and balance new tires. 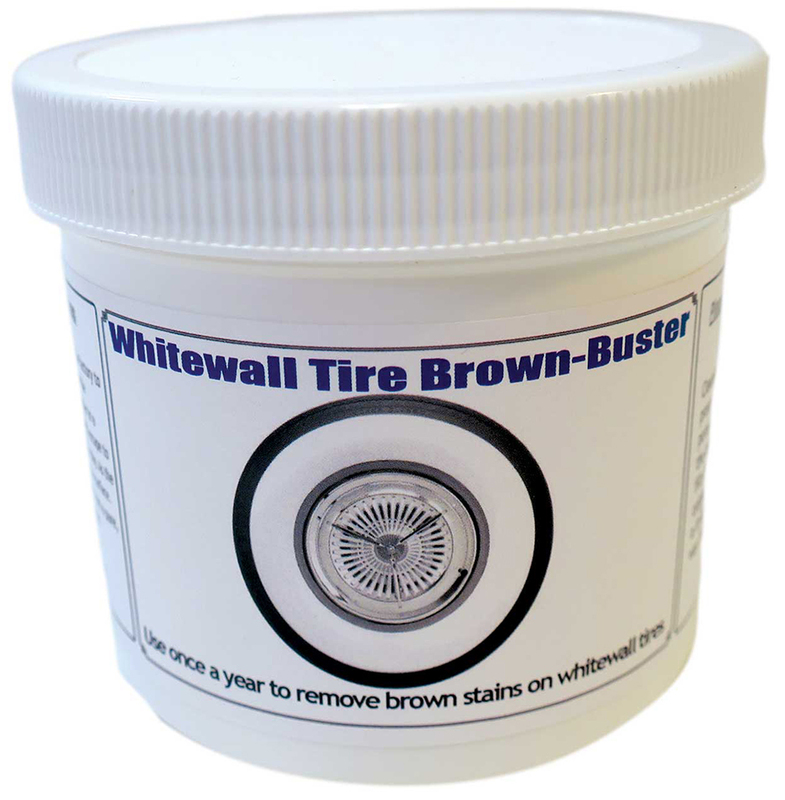 It is recommended that you reapply the Whitewall Tire Brown Buster every 12 months, but do note that not all yellow stains can be removed, particularly where they have existed for months or years and the tire has been cleaned with products containing harmful agents, such as bleach and lye. S.O.S, Comet, Ajax, and Brillo are known to turn whitewalls yellow, and in some cases no product can restore them. Whitewall Tire Brown Buster is useful on Sure-Trac, Remington, Milestar, Travelstar, and other imported and domestic tire brands where the whitewall has turned brown. 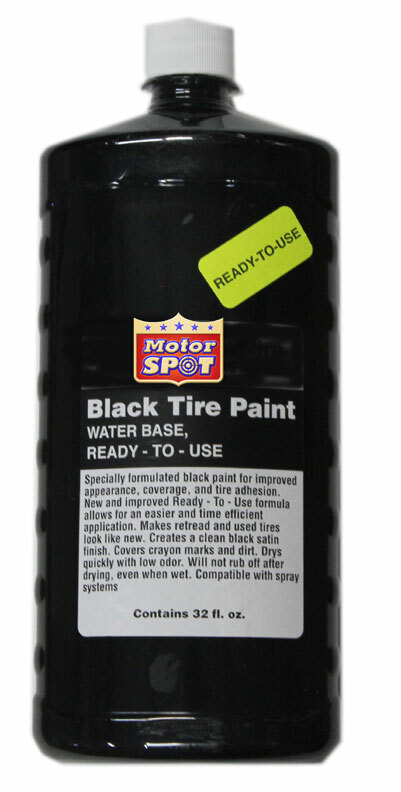 Available in 12- and 32-ounce containers; the 12-ounce size is good for four tires and the 32-ounce container will work on 12 tires. Please click here for instructions prior to purchase. Fixed price shipping in Continental U.S.: $11.95 per bottle. Set of Four available in 14 or 15 inch sizes. Comes with locking device to minimize the chance of loss or theft. The center portion of the cap sticks up 1.25 inches high and is hollow. The opening on the backside of the center part or hub is 3.25 inches wide. Price: $249.00 for the set of four. 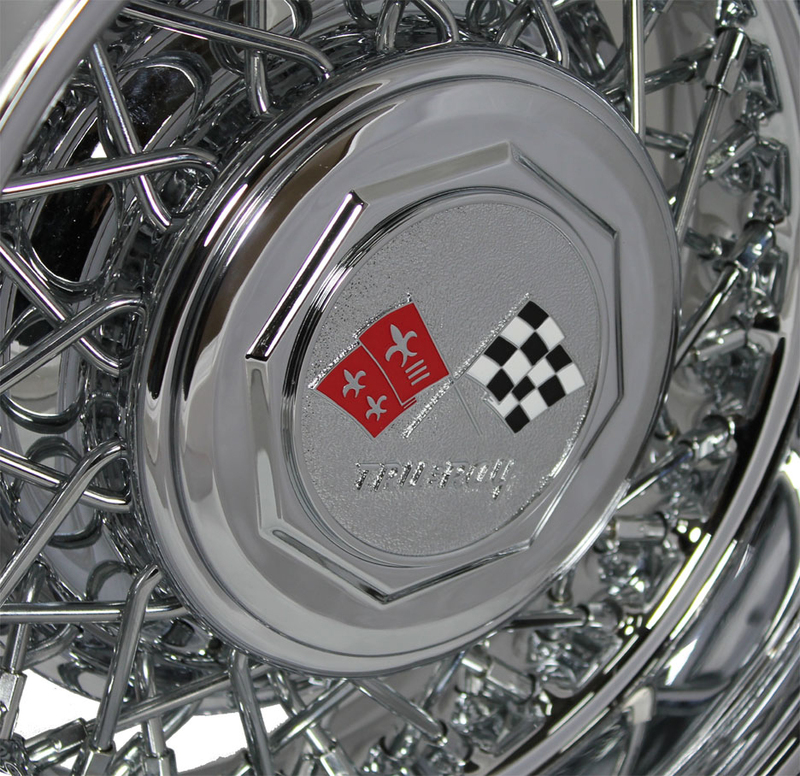 Chrome-plated wheel covers with chrome zinc die-cast cross bars. This is a set of four. Please specify 14 or 15 inch wheel size. Price: $199.95 for the set of four. Triple nickel and chrome finished. Select 14 or 15 inch wheel size. 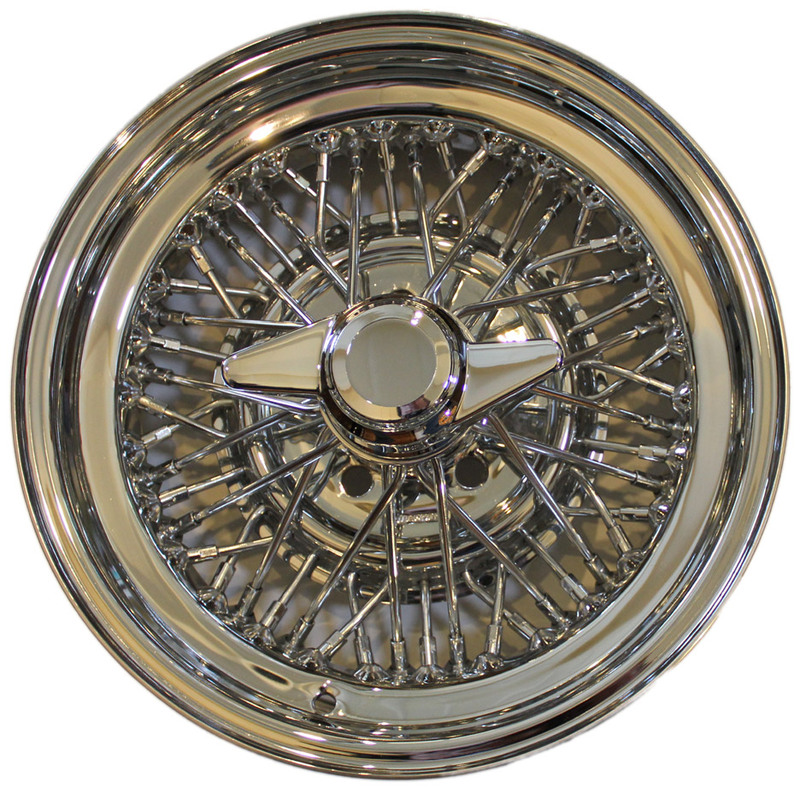 1956 Olds Fiesta style spinner hubcaps are chromed metal with tri bar. Available in 14" and 15", and sold in sets of 4. 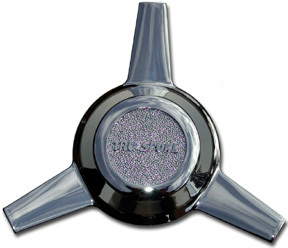 Chrome wheel cover with chrome zinc die-cast tri-bar. 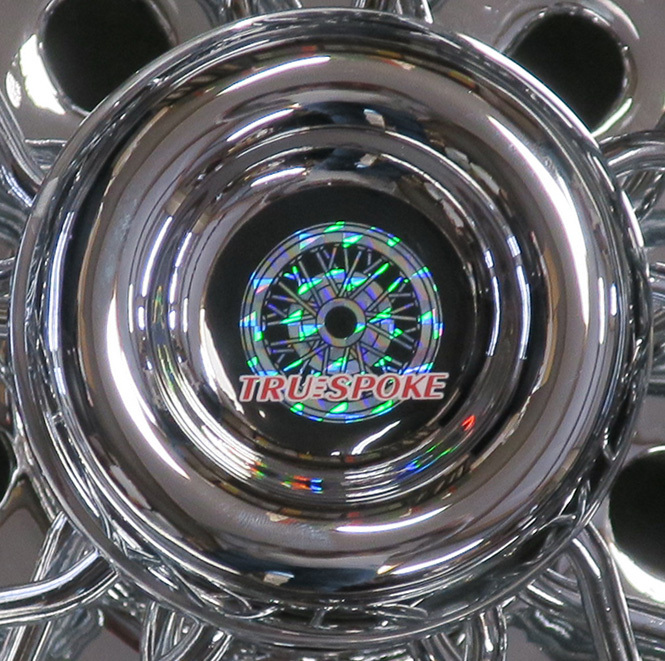 Triple nickel chrome plated wheel covers. Set of four wheel covers. Select 14 or 15 inch diameter. 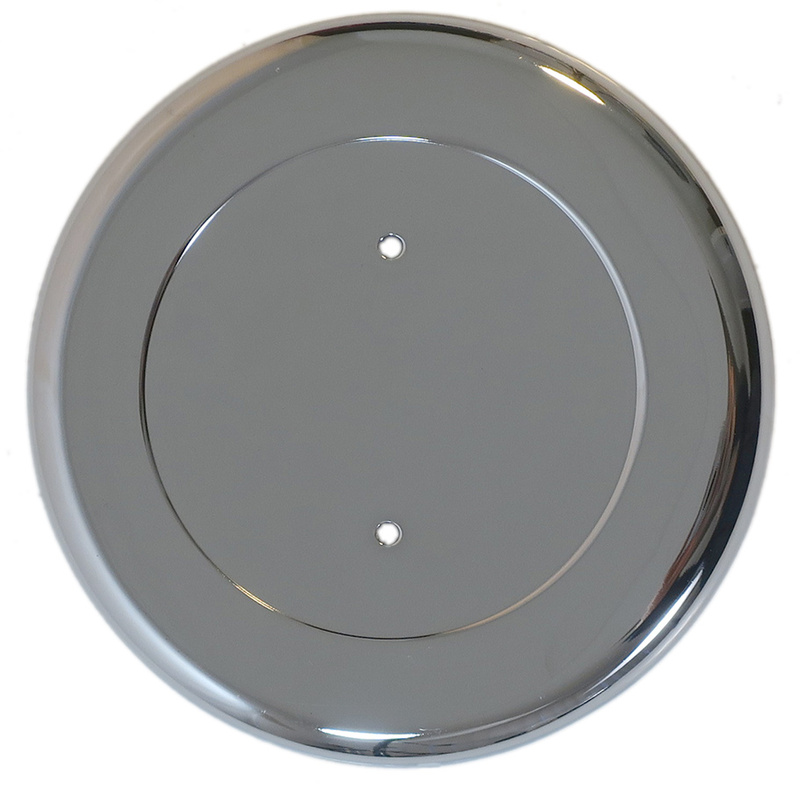 Chrome plated wheel covers with chrome zinc die cast cross bars. Please select 14 or 15 inch diameter. 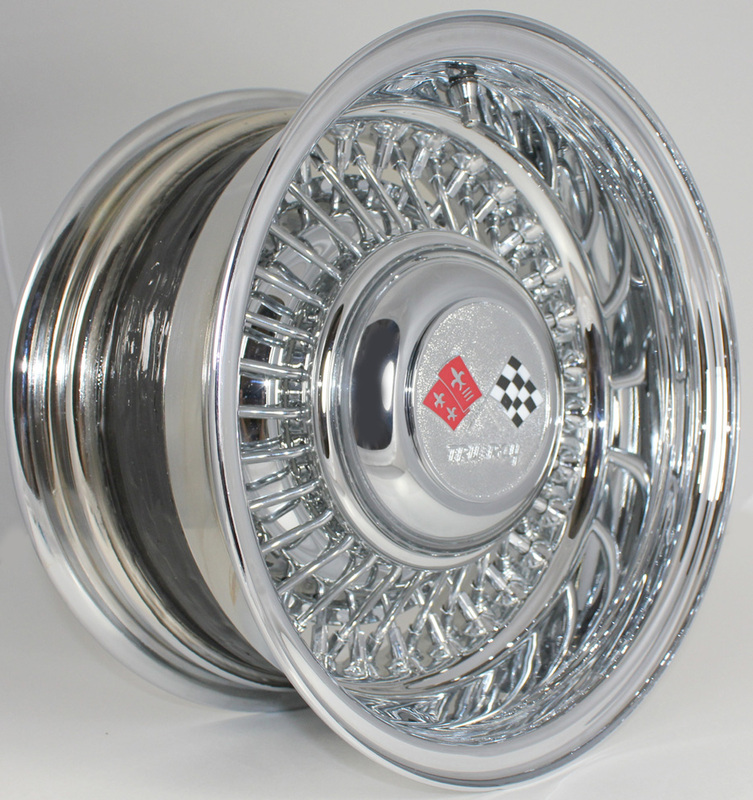 These fit on most steel wheels to give your vehicle the kooool look. 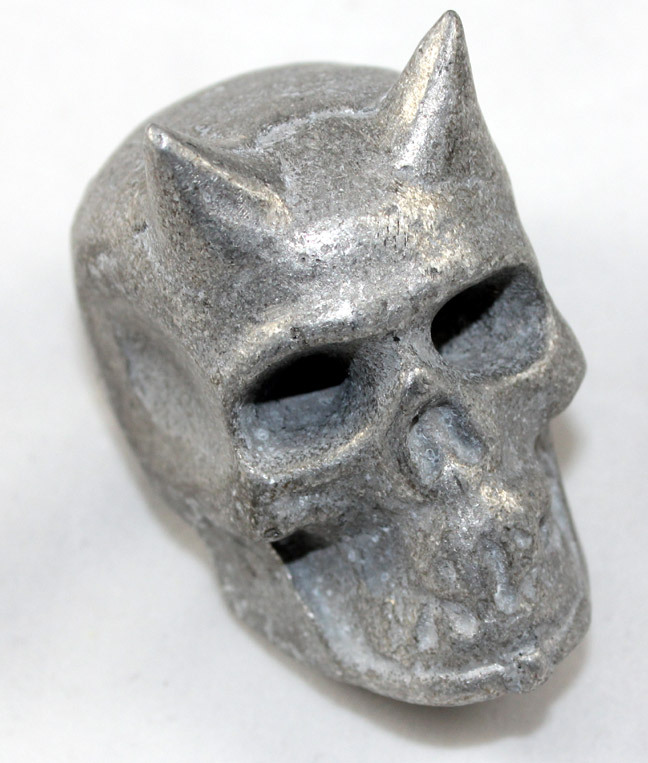 Chrome zinc die cast finish. Price: $200.00 set of four. 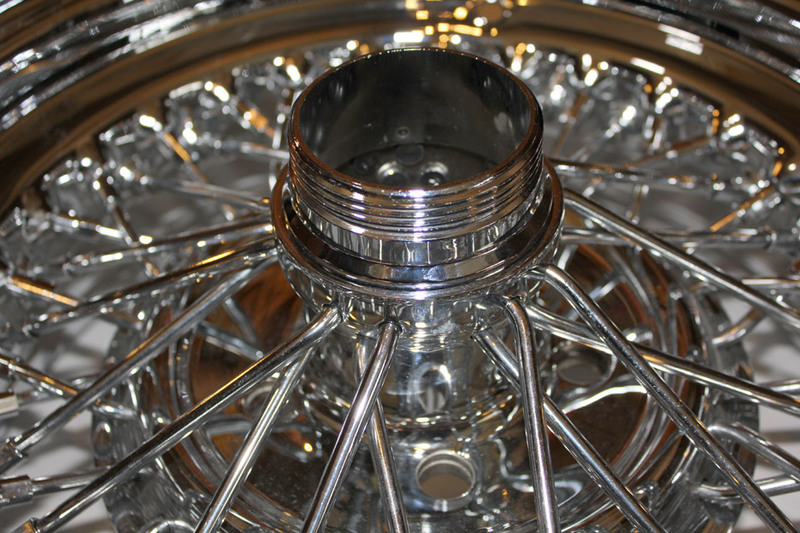 Some of our customers mount bullets like these in their hubcaps for a very kool look. Check out the photos of John D'Agostino and Rick Dore's latest kustom cars and you will get the idea. Both bullets have holes drilled in them to accept a long bolt. You will have to use a disc or other method to secure the bullet on our hubcaps. 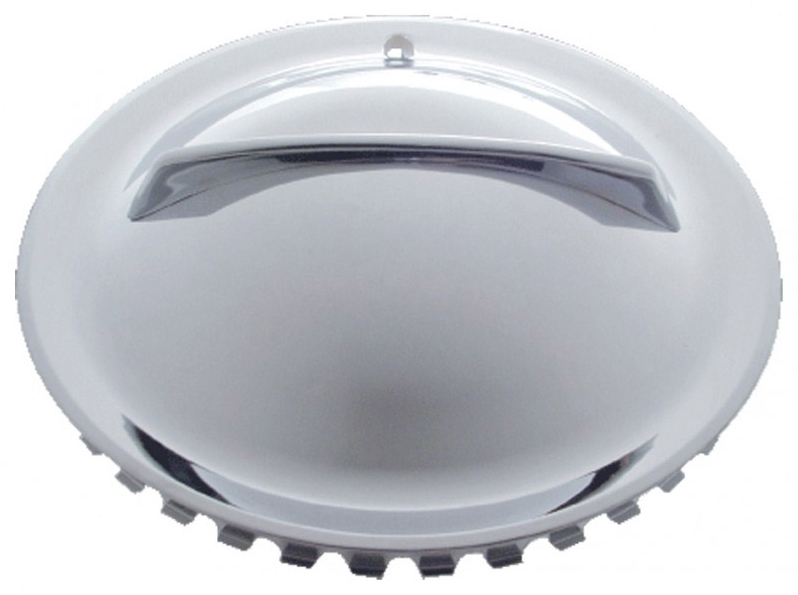 The small, rounded cap on the left has a diameter of 4 1/8" and a height of 1 1/2". 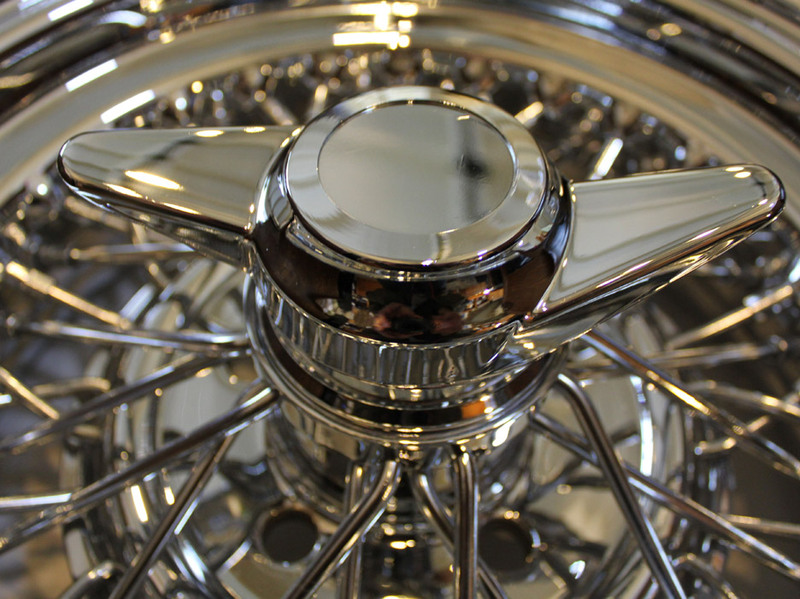 Excellent chrome plating and steel construction. $15.00 each. The tall, pointed bullet measures 4 1/4" high and has a diameter of 3 1/2". $15.00 each. Set of four valve stem covers. Chrome finish with red eyes. Four pieces mounted on a card. 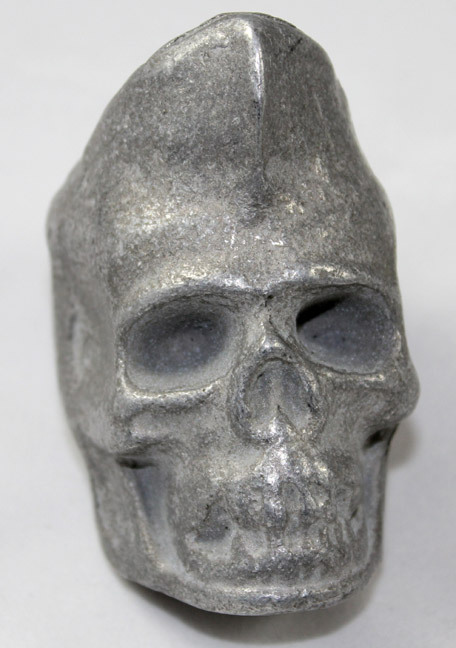 Made from cast aluminum by hand in California. These unique pieces look especially great in Kustoms, Hot Rods and anybody wanting a different look for the interior of their car. 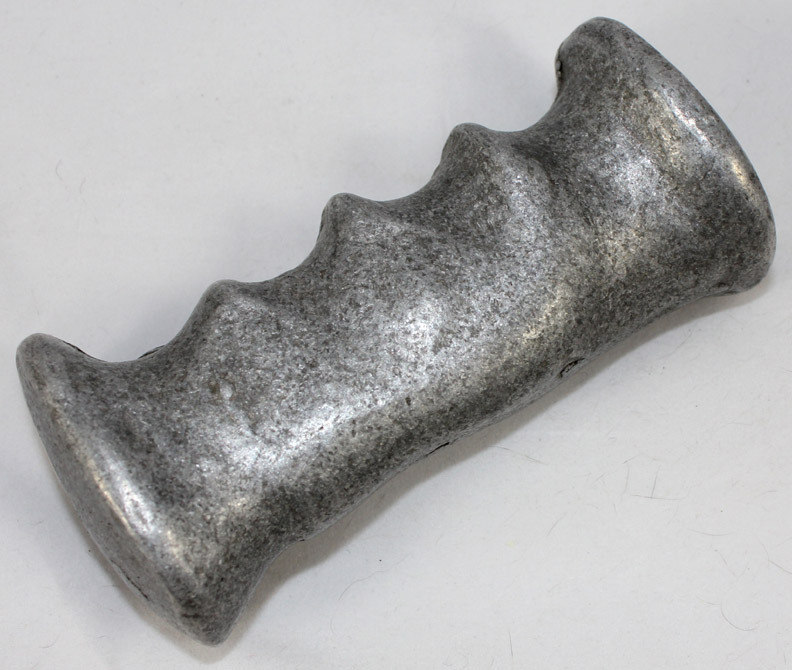 The shift knobs come unfinished in raw aluminum. 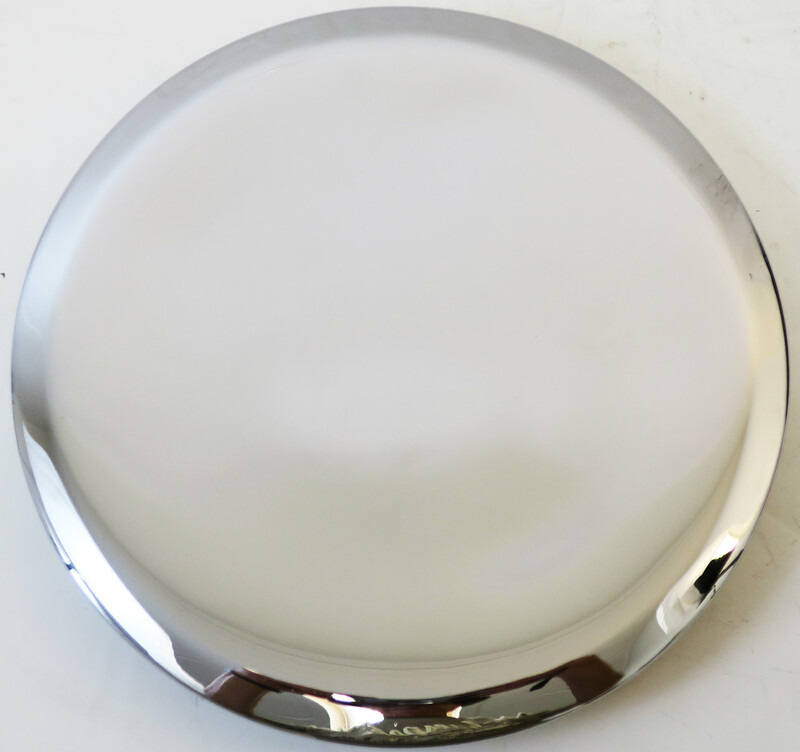 Polishing is available at extra cost. 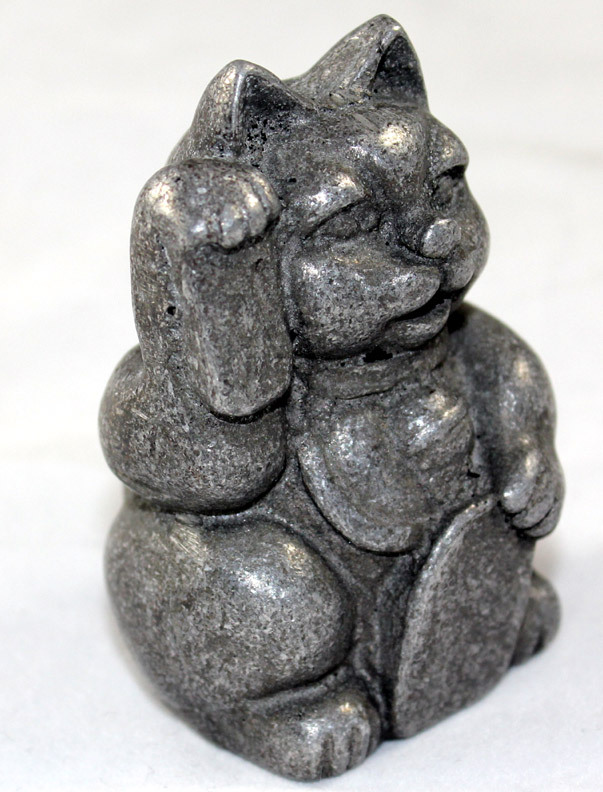 The Fortune Cat and Skull knobs are approximately 3" tall and 2.5" wide at their largest point. The Grip Shifter is 4.5" long by 2" wide. The items are un-drilled. You will have to drill out the hole for your shifter threads. Close-out Sale Price: $19.95 each unpolished. You need cool looking shoes to drive cool looking cars! We are always looking for products created for the automotive enthusiast to the professional driver. You can be sure that the items shown offer you style, comfort and performance. 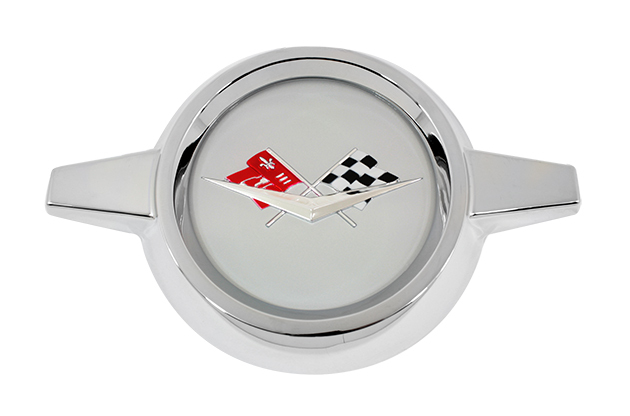 Both on and off the racing circuit, merchandise from our collection will serve their purpose well.